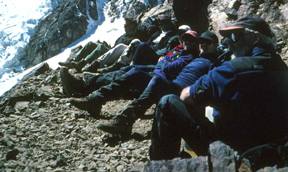 In the high peaks, members of a “team” demonstrate cooperative and supportive behavior in a common effort to accomplish hard goals. Team members are equals and friends who value a relationship built over time and expressed in mutual understanding, honesty, sympathy, empathy, and loyalty. And, the knowledge of one-another within a team allows complementary abilities and coordinated efforts to generate synergy, which enables a “team” to be greater than the sum of the individuals. A team offers safety by being supportive and trustworthy, while a group of strangers may not be safe at all. To build a team, we need people we know, people we trust not to selfishly, foolishly or ignorantly put us in danger or fail to respond properly to an emergency. Finding a group of people is just the first step. We then need to turn our “group” into a “team,” and that take time and effort. This essay will look at (1) finding people and (2) turning a group into a team. Our goal is to be on one or more adventure teams that completely satisfy our demand for safe success atop the high peaks. To accomplish this, most of us must continue recruiting people throughout our lifelong quest. Finding people to be in our group is much like finding people for an important job. And like the job analogy, they are looking to see if we are a good fit as well. how to determine a good fit. There are two sets of attributes for potential partners: character attributes and experience attributes. It is far more important for our partners to be of high character than of high experience. These are the people in whose hands we will place our safety. And, generally, a person can gain experience more easily that they can develop character. 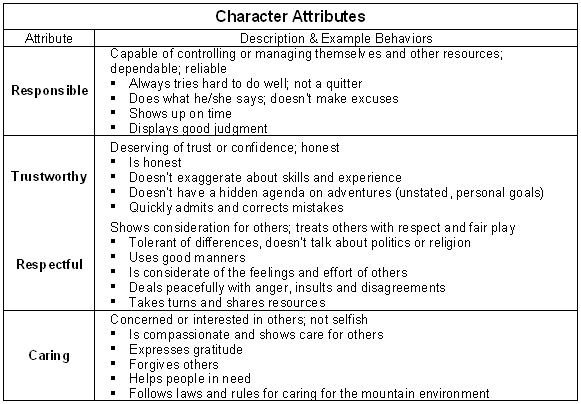 An ideal person would demonstrate all of the following characteristics, but we can allow for some failings in a person of otherwise high character. Regarding “experience,” we each have a unique set of physical, mental and emotional abilities that accumulate in our mountain adventures. To simplify this description, we only distinguish between “experienced” or not (i.e., “inexperienced”). An “experienced” person has good physical, planning & decision-making skills, a good fitness level and a knowledge-based tolerance for risk. Clearly, there can be a wide range of experience levels in this category, but that is not important for this purpose. Plus, anyone who does not fit this description is in the “inexperienced” category, even though some in this category would be more experienced than others. There is no best level of experience to look for in potential partners, although there is an impact on the adventures we can do. The table below describes the various combinations of experience level pairings that work for various partnering strategies. The number one place to look for partners is from our fellow students in mountain adventure classes. Everyone who plays in the mountains should take classes from experts who can get us started in the right direction. The people we meet there will also be looking for partners who know important safety skills, and where better to find credible partners than in class. Classes are offered by a number of sources, including Colorado Mountain Club (www.cmc.org) and the many guiding & training services in Colorado. Another great way is to start with current friends. Take a class together. Do some easy hikes. Gradually build up from there and see if the interest grows. A thousand days atop the high peaks is about a lifetime in the mountains. There is no reason to rush in and take chances. Take it easy, but take it. Lastly, a reasonably good place to look for partners is on the discussion boards of the local mountain adventure websites, such as 14ers.com and Fourteenerworld.com, and on bulletin boards at local climbing shops. There are lots of great people out there looking for partners, but you never know what kind of person you are going to find this way. Always ask for references (e.g., have you hiked with anyone else from this board?). And a bit of common sense is appropriate if you have any security concerns. Don’t meet for the first time in the middle of the forest in the middle of the night on a Tuesday. Be very public and/or bring a big friend. Talk first. Chat on phone or in person (no trust text based conversation at first). Ask about experiences and past adventure groups & teams. Find out why they are available now? Did they just start hiking; are they looking for more partners for their group? Or is it that they have no friends; they usually go alone because people don’t like them; or something other ominous reason? Go with your gut feelings on this. To “yield and overcome” means to sometimes run away. Start small. Do a safe hike together. Something easy and crowded with a goal to spend time together without extending any trust. If we also bring existing partners, we must be sure to focus on the new partner to learn what we can. See if we get along with this person and can stand to spend many hours with this person. If all goes well, then keep going. Take a bigger step. Do a harder adventure together. Start to extend some trust. Take notice of how the new partner deals with stress and physical distress. Notice how they respect our needs and whether they are caring toward anyone else. If all goes well, we’ve found another partner for our group, or to start a new group. And remember, potential partners are sorting us out as well. Don’t come off like a nut job. Start slow. Be available, but not too available at first. And, don’t talk too much or about sensitive subjects, such as politics or religion. And don’t play hard to get or hard to like. Just be a nice person who other people will enjoy spending time with. Recruiting is an all the time activity for us high peaks adventures who prefer to go with friends. Our goal should be to have one to three people who we really like, who like the same type of adventures, and who want to go play in the mountains the same days of the year. A team of this sort is something to aim for, but not to expect it quickly. Generally, it is best to have a pool of partners, some friends and some not friends yet. Most people are busy and cannot commit to adventuring every week; so we have a pool of people in our group or in our multiple groups to allow us to satisfy our personal demand for days atop the high peaks. Our adventure teammates do not have to be our best friends, just friends. But, before we head into the mountains, we need to figure out the structure of our group so we can operate safely. The ideal structure depends on the nature of our adventures and the experience levels within our group. The key to a safe “group” and a successful transition to a “team” is the use of the proper group structure for leadership and decision-making. 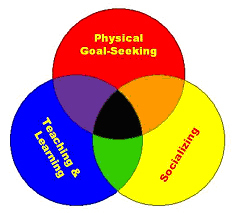 Every mountain adventure has elements of socializing, teaching/learning and physical goal seeking. The structure of a group is determined by the one element that is dominant in the group’s adventures. 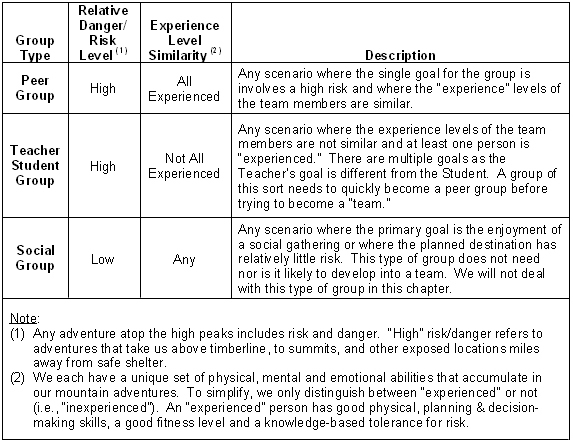 The dominant element is a function of two factors: (1) the relative risk or danger level of the group’s adventures and (2) the similarly in “experience” level among the group members. The key to being safe while building a team is honesty between the members. The group must be able to honestly assess which group type they have and each person be able to commit to the duties they hold in such a group. If anyone in your group cannot be relied on in this way, they (or you) must go. This subject is reviewed in greater detail in the next essay (Learning to Work Together) which covers building relationships and learning to work together.